Tyler McGee cuts the Samsung Galaxy S Cake to open its Sydney retail store. February 2009: After leaving his post as president of Nokia Japan, Tyler McGee joined Samsung Electronics Australia as VP of telecommunications for the local subsidiary. May 2009: Samsung launched its flagship mobile device for 2009, the Ultra Touch, combining a touch screen with a slide out numeric keypad. In what may now sound like a quaint goal for one of the world’s leading smartphone brands, McGee said just one month later, “We want to own touch”. August 2009: McGee oversaw the launch of the Icon range of smartphones, with five models across four separate operating systems. July 2010: The brand took a more consolidated approach with the launch of the Galaxy Wave, the world’s first smartphone to use an AMOLED screen. The release was tied in with the launch of Samsung’s dedicated app store, with McGee announcing local app developer days to support the initiative. November 2010: McGee presented Samsung’s first Galaxy Tab device to the Australian market to bring a “wealth of portable entertainment” to users, as well as a app-based navigation (thanks to a deal with Navigon). The device was followed by a number of newer iterations, including the Tab 10.1, released in April 2011. October 2011: McGee used the launch event of Samsung’s Music Hub platform to announce that the brand had claimed number one market positions for both mobile phones and smartphones. February 2012: Samsung partnered with brand ambassador James “The Missile” Magnussen for the Olympics. Magnussen’s Messiah-like pose was plastered across Sydney’s QVB building and he appeared in a number of marketing drives for the brand. Months later he failed to reach his expected apotheosis, bringing in bronze and silver at the Olympics. March 2012: A busy month for McGee, who unveiled the ‘innovative’ Galaxy SII 4G, and the new Note smartphone-tablet hybrid, described as “Samsung’s own product category”. May 2012: At the launch of the Galaxy SIII smartphone, McGee announced the company was “investing heavily” in its retail presence. 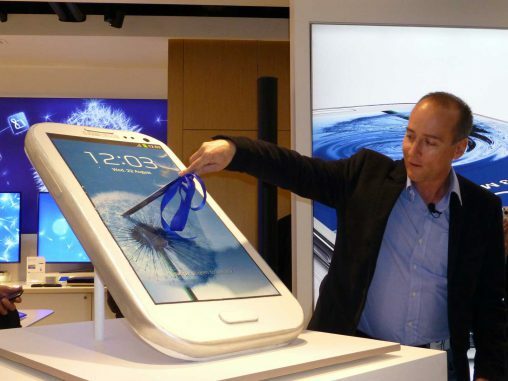 August 2012: Samsung opened its first Experience Store on Sydney’s George Street. November 2012: Continuing Samsung’s strong tradition of releasing products with a new number on the end, McGee unveiled the “powerful” Note II. While dynamic at the launch McGee couldn’t match the curious performance from pop stars Ricky-Lee and Sam Sparro. March 2013: McGee attended the opening of Samsung’s second Experience Store in Melbourne. At the launch McGee said Samsung didn’t have a “fixed number” of direct-to-consumers stores it planned to open mind, but it would use insights from the new store for its greater retail strategy. September 2013: For his last major launch with Samsung, Tyler McGee introduced Australians to the newest Note device, the Note 3, as well as the brand’s foray into wearable technology: the Galaxy Gear. 26 November 2013: Samsung announced the departure of Tyler McGee from the company, and the appointment of a new VP of telecommunications, Prasad Gokhale.